Pierre Bonnard (1867-1947), Interior (c 1905), oil on canvas, 49.8 x 37.8 cm, Private collection. The Athenaeum. In 1904, Bonnard had started to travel more and further afield, in the summer taking Marthe to the north coast, and later visiting Saint Tropez on the Mediterranean. The following year, he visited Belgium and Holland in company with the painter Pierre Laprade, the composer Maurice Ravel, and their patrons Misia and Alfred Edwards, on the maiden voyage of the latter’s private yacht l’Aimée. Coupled with visits to London and Spain with Vuillard, this enabled Bonnard to visit art collections across much of Europe in a systematic way. 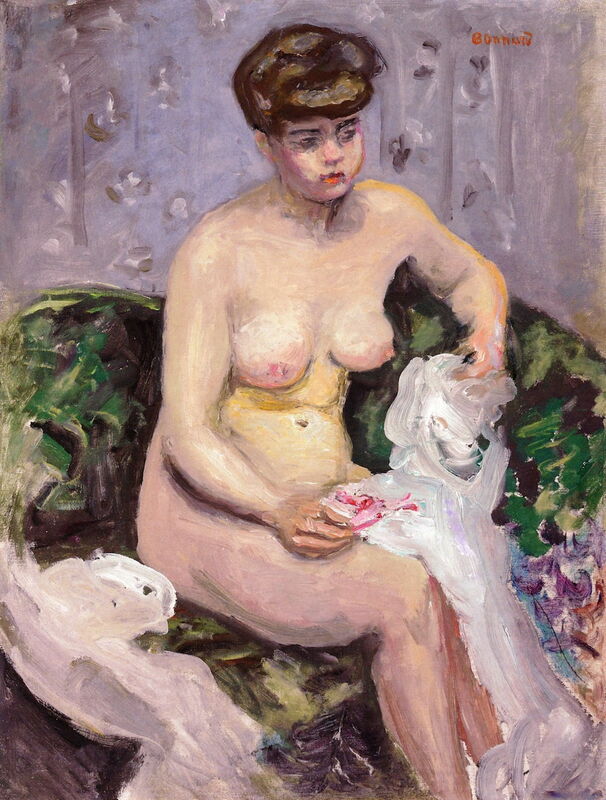 Bonnard also visited Berlin, where he painted a portrait of the wife of the painter Curt Herrmann. Pierre Bonnard (1867-1947), The Tuileries Garden (1905), oil on board, 24.8 x 49.5 cm, Private collection. The Athenaeum. Judging by the brown foliage in the trees in The Tuileries Garden (1905), Bonnard painted this in the autumn. The rich array of statuary stands out well. This garden in central Paris had been a popular location for the paintings of Manet and the Impressionists. Pierre Bonnard (1867-1947), Two Elegant Women, Place de Clichy (1905), oil on panel, 73 x 62 cm, Private collection. The Athenaeum. 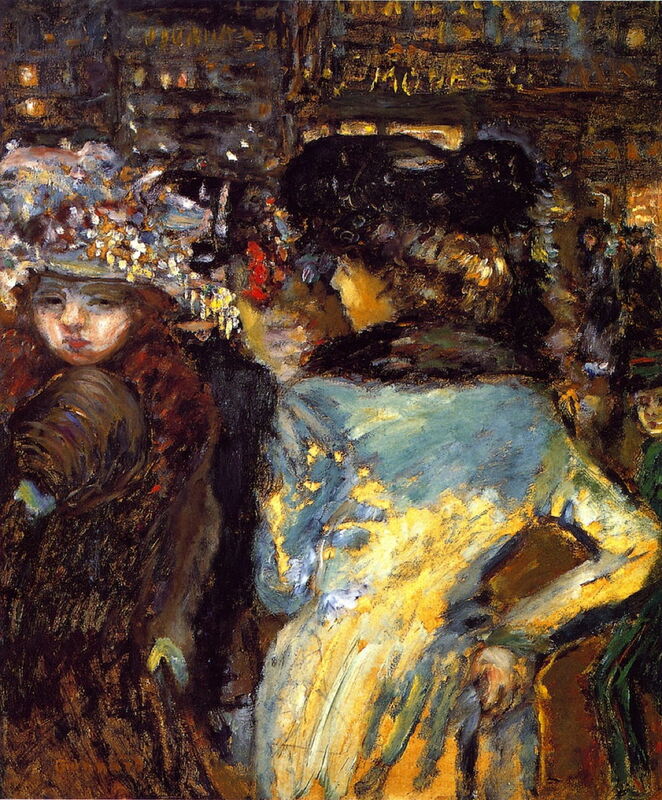 In Two Elegant Women, Place de Clichy (1905), Bonnard fills his panel with the figures of two women dressed in the latest fashions, that on the left with a hat which dazzles as much as the lit street behind. Pierre Bonnard (1867-1947), Boats in Port at Low Tide (1905), oil on canvas, 30.5 x 30.5 cm, Private collection. The Athenaeum. 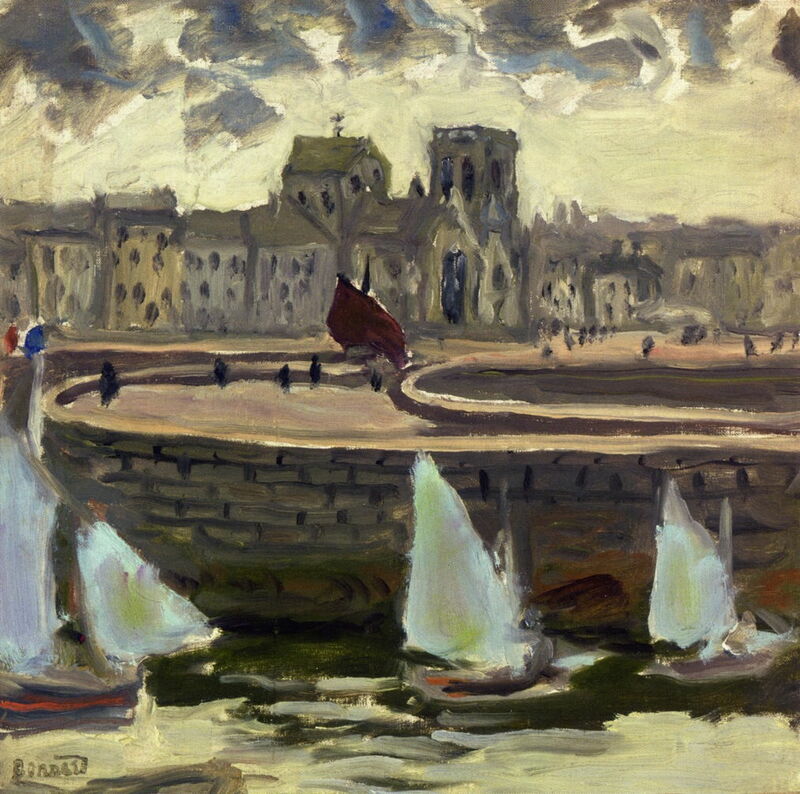 No doubt influenced by his cruise on board Alfred Edwards’ yacht, maritime motifs such as Boats in Port at Low Tide (1905) start to appear among Bonnard’s work at this time, although this painting may have its origins in his stay on the north coast the previous year. Pierre Bonnard (1867-1947), In a Boat (1905), oil on canvas, 51.4 x 55.6 cm, Private collection. The Athenaeum. Bonnard’s In a Boat (1905) appears to have been painted on a river or a lake in a park, though. He has shaped the striped clothing on his model more than he might have done during the height of his Nabi style, giving her a more conventional 3D appearance. In the early years of the twentieth century, Bonnard used mirrors and reflections in several paintings, including this Interior from about 1905. 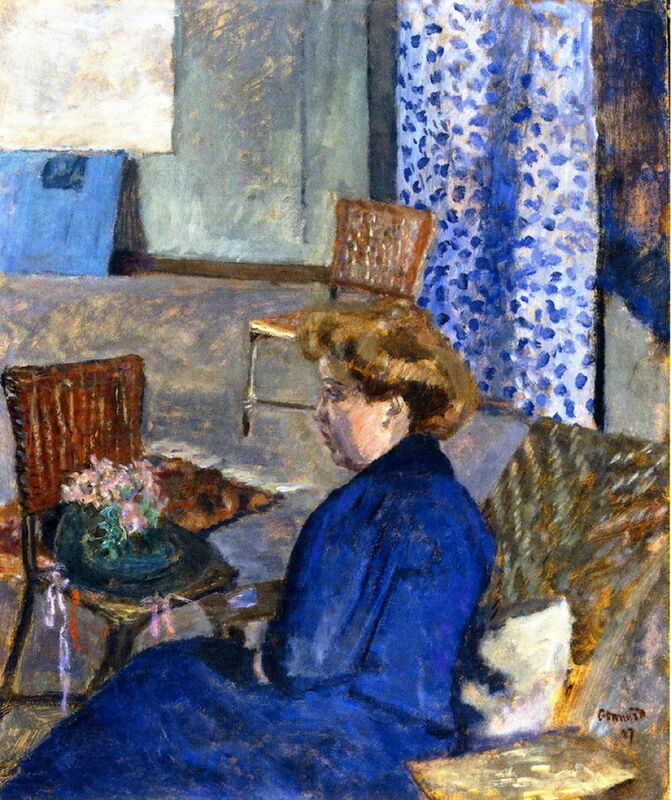 It is an unusual composition, with but a little of the woman’s back visible in the mirror; Bonnard instead shows the reflection of a chair placed in front of the mirror, and what appears to be the artist sat at a table. His purpose in placing the chair in front of the mirror was, I think, to demonstrate that the artist’s eye is in line with the chair and with his own reflection, confirming that it is him who is sat at the table, although he doesn’t have an easel, neither is any canvas or palette visible. Pierre Bonnard (1867-1947), Model with a White Robe (c 1905), oil on canvas, 65 x 50 cm, Private collection. The Athenaeum. Bonnard’s Model with a White Robe (c 1905) doesn’t appear to be Marthe, but is most probably the same he used in Interior and In a Boat above. She appears to wear a chignon, in which case it is likely to have been Anita Champagne, who was a favourite of his at the time. At the end of 1905, Bonnard moved studio, ironically taking over part of a building which had been a convent. In 1906, Bonnard was busy again travelling. At the end of the winter, he visited Marseille and Toulon, then in the summer he toured Belgium and Holland again with Misia and Alfred Edwards on board the yacht l’Aimée. In the Spring, he had a successful solo exhibition at Vollard’s gallery. In November, though, he had another solo exhibition, this time at Galerie Bernheim-Jeune, which became his standard venue until the Second World War. 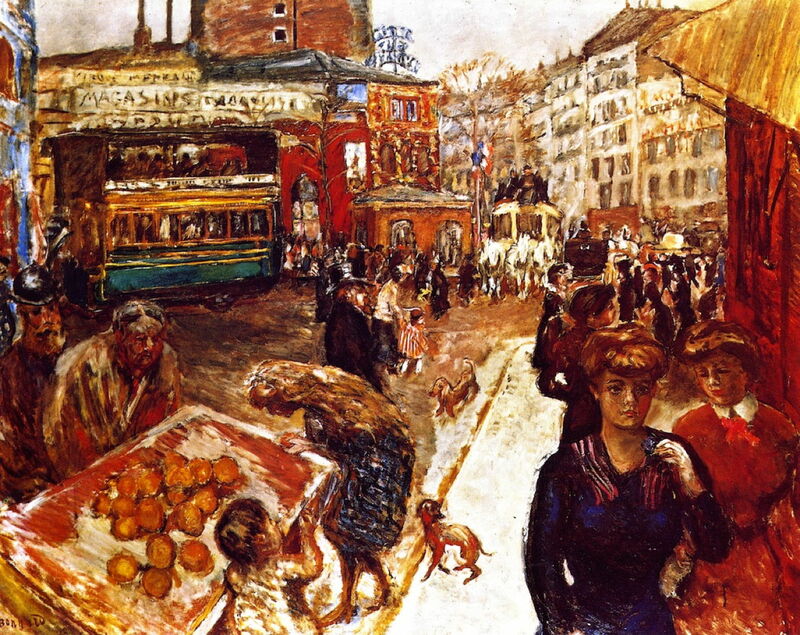 Pierre Bonnard (1867-1947), Place Clichy (The Green Tram) (c 1906), oil on canvas, 121 x 150 cm, Private collection. The Athenaeum. Place Clichy (The Green Tram) (c 1906) shows this very busy intersection at the edge of the Montmartre district of Paris, more properly known as Place de Clichy. The streets are crowded with a tram (which had only recently been electrified), several horse-drawn vehicles, and a market barrow in the foreground. There are also pedestrians almost everywhere, even some small dogs. Pierre Bonnard (1867-1947), At the Seaside (Strollers on the Promenade) (1906), oil on board, 38 x 56 cm, Private collection. The Athenaeum. 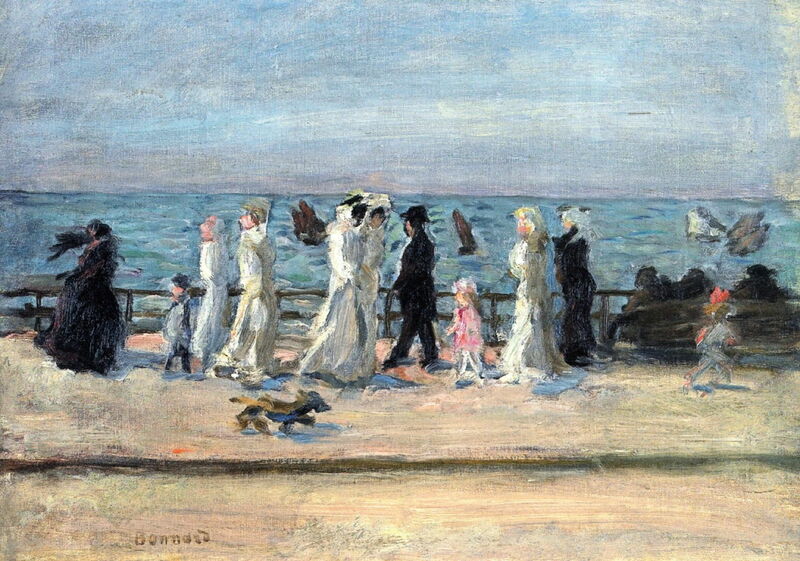 Bonnard’s At the Seaside (Strollers on the Promenade) (1906) revisits a theme which had developed from the paintings of Eugène Boudin, and flourished with Monet and the Impressionists. 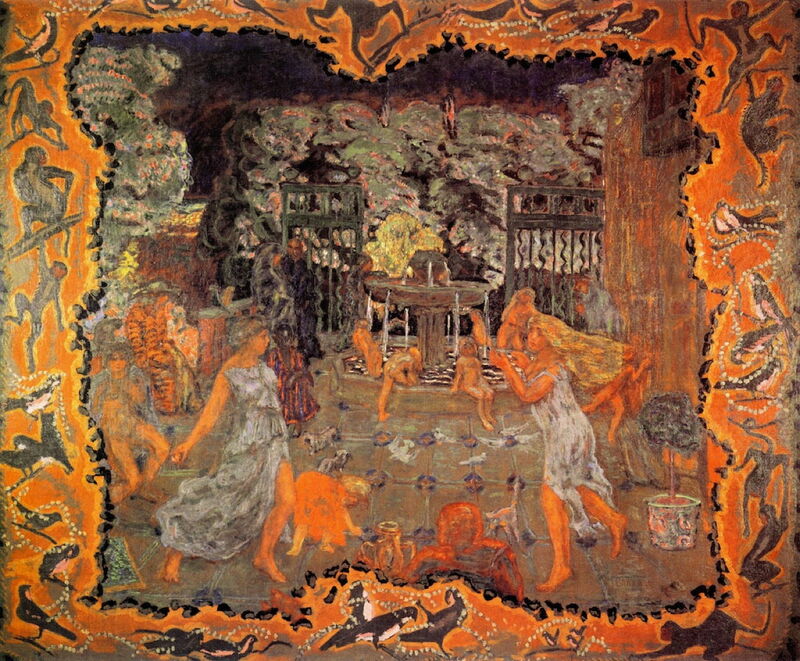 Pierre Bonnard (1867-1947), La Casa de Misia Sert (The House of Misia Sert) (1906), tempera on canvas, 38 x 46 cm, Musée d’Orsay, Paris. The Athenaeum. 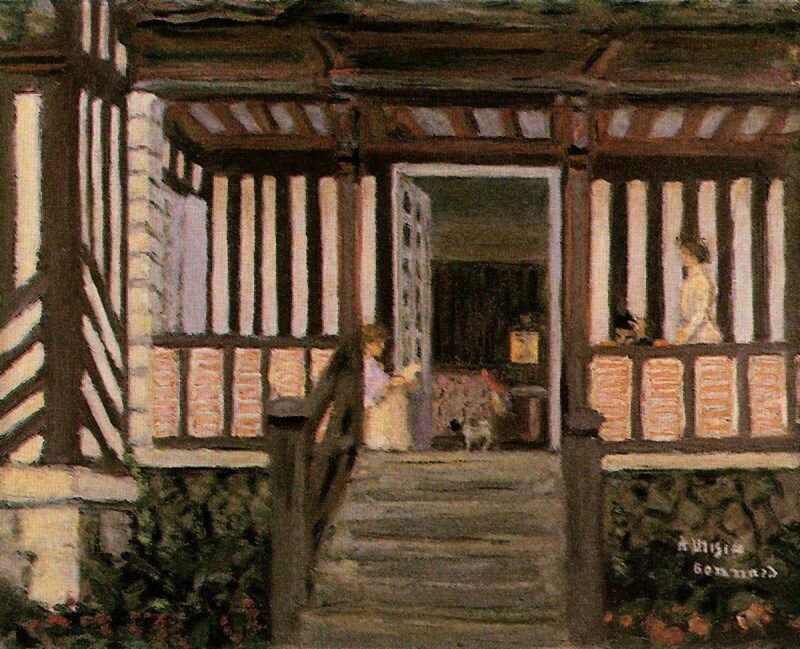 Bonnard dedicated his painting of La Casa de Misia Sert (The House of Misia Sert) (1906) to the former Misia Natanson, muse, close friend, and patron. This was made using tempera rather than oils. Misia Godebska (1872-1950) had first married Thadée Natanson, who published La Revue Blanche. She met Alfred Edwards, who founded and owned the leading Paris newspaper Le Matin, through Natanson’s business dealings, and in 1903 became Edwards’ mistress. Edwards offered Natanson the capital that the latter needed, on condition that Misia was released to marry Edwards. Misia married Alfred Edwards in 1905, and settled into a lavish apartment overlooking the Tuileries Palace in Paris, and the property shown in Bonnard’s painting. Edwards perhaps inevitably proved unfaithful, and the couple divorced in 1909. She then married the Spanish painter José-Maria Sert in 1920 – which proved to be another tumultuous relationship, ending in divorce in 1927. Misia’s portrait was painted by Toulouse-Lautrec, Renoir, Vallotton, Vuillard and Bonnard, and Maurice Ravel dedicated two pieces of music to her. By the time of her death in 1950, Misia had been a muse and patron to countless painters, writers, composers, and ballet dancers, including Sergei Diaghilev, whose funeral she paid for. Pierre Bonnard (1867-1947), The Cats’ Lunch (c 1906), oil on canvas, 60 x 73 cm, Private collection. The Athenaeum. 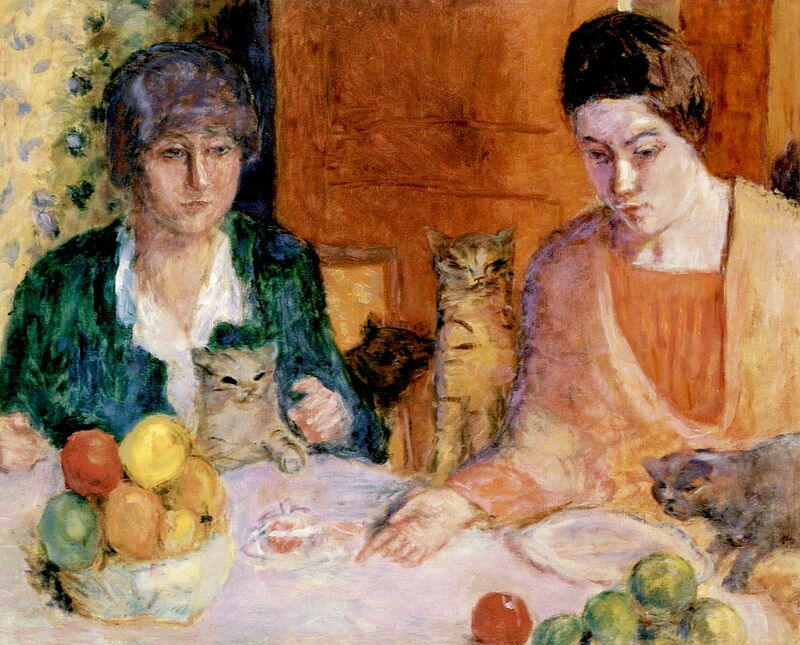 Bonnard seems to have had a liking for cats, which appear in several of his paintings, such as The Cats’ Lunch from about 1906. Two women are sat at the table, feeding their four cats. The women don’t look at the cats, nor at one another, but stare blankly into the space in front of them. 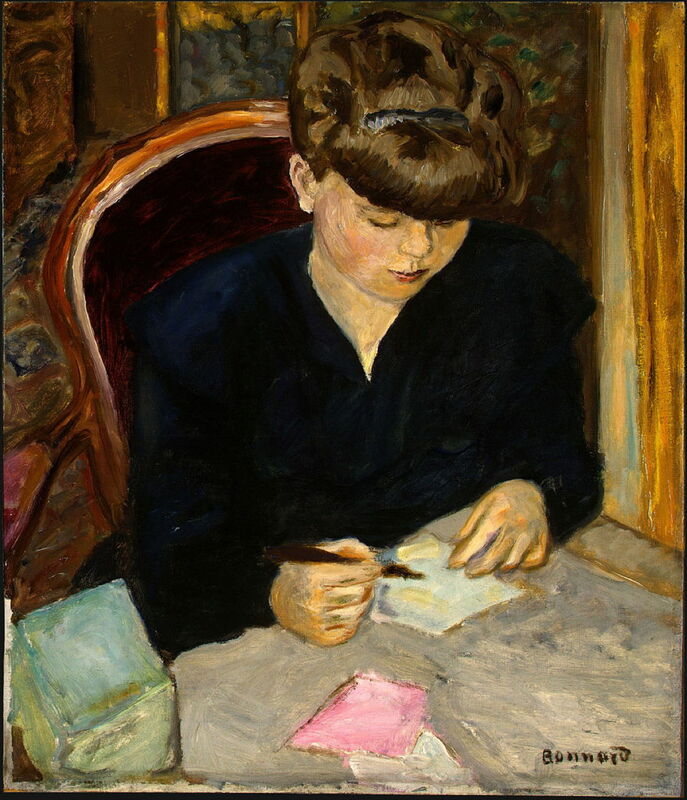 Pierre Bonnard (1867-1947), The Letter (c 1906), oil on canvas, 55 x 47 cm, The National Gallery of Art, Washington, DC. The Athenaeum. The Letter from about 1906 is a more conventional portrait of a well-dressed woman sitting at a table to write a letter. The model may again have been Anita Champagne. Pierre Bonnard (1867-1947), Woman Getting Dressed (1906), oil on canvas, 42 x 58.7 cm, Private collection. The Athenaeum. 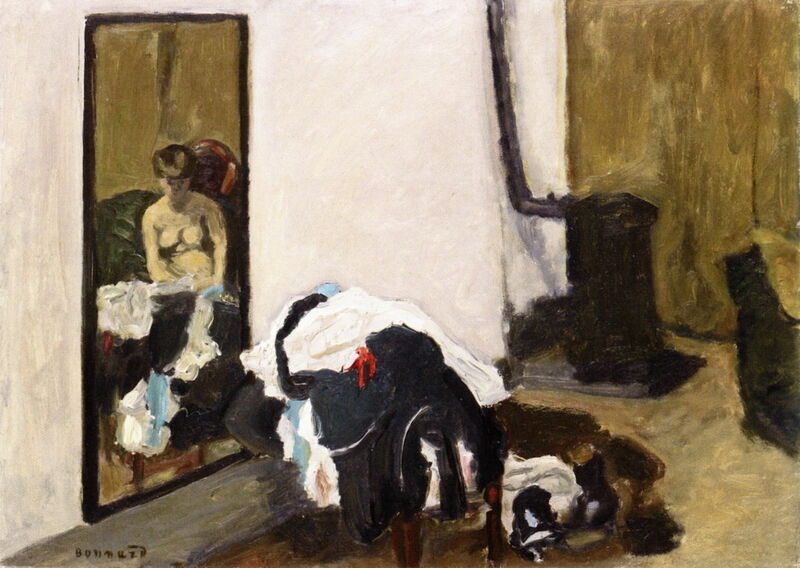 Woman Getting Dressed (1906) is a second example of Bonnard’s optical play with reflections. Dominating the centre of his canvas is a pile of women’s clothing on a low item of furniture, and a heater. 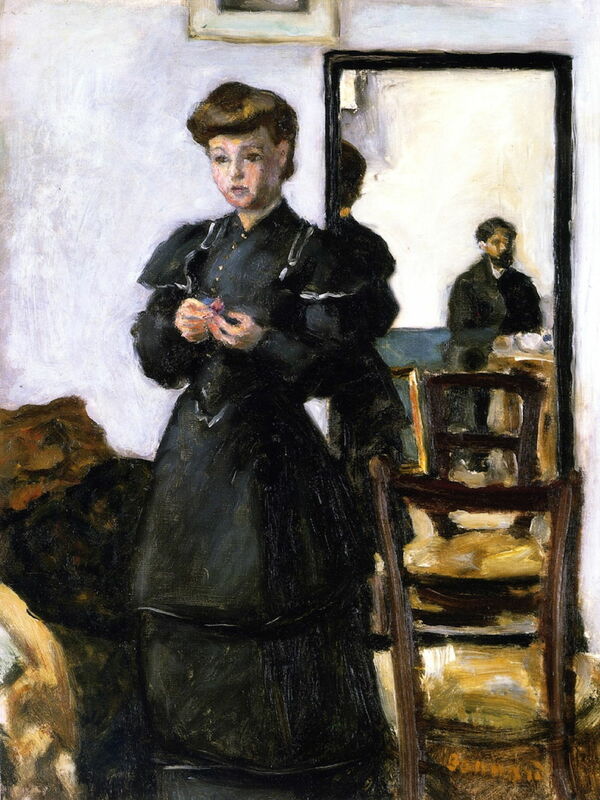 A flat mirror at the left reveals the subject, who is sat beyond the right edge of the painting, getting dressed. Pierre Bonnard (1867-1947), Pleasure (1906), oil on cardboard, 250 x 300 cm, Private collection. The Athenaeum. Pleasure or Games (1906) is another unusual work, a large painting on cardboard which was one of four panels for Misia and Alfred Edwards’ apartment in Paris; the others were Travel, Play I, and Study. Their style is decorative, reminiscent of fanciful Rococo ornamentation and fantasy, and their colours vibrant. The central image shows young women cavorting in an idealised landscape, with a fountain and two large gates which are partly open. The decorative edging includes images of birds and monkeys, with strings of beads or pearls. The four were exhibited at the Salon d’Automne in 1910. Pierre Bonnard (1867-1947), In a Boat (c 1907), oil on canvas, 74 x 85 cm, Private collection. The Athenaeum. 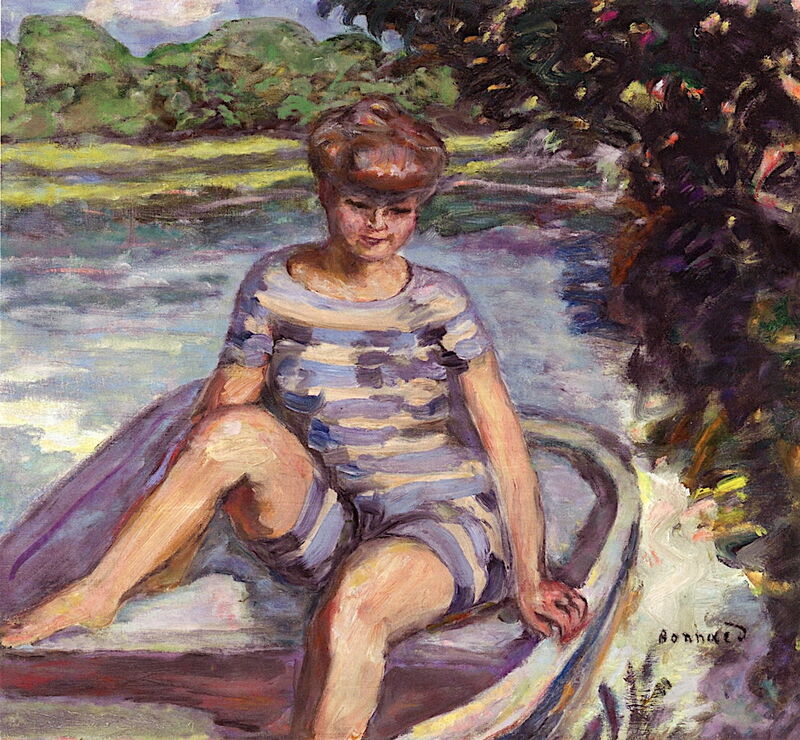 In a Boat (c 1907) is very different from his previous painting of a woman in a small boat. Here, three figures, probably all women, are in a larger vessel, perhaps a punt. At the right is a fisherman, and there are ducks at the left. Beyond the small pond is a weeping willow tree, houses, and a distant hill. The colours suggest this may be in the brighter light of the south of France. Pierre Bonnard (1867-1947), In the Country: Father and Daughter (1907), oil on canvas, 102 x 33 cm, Private collection. The Athenaeum. Pierre Bonnard (1867-1947), In the Country: Mother and Child (1907), oil on canvas, 100 x 33 cm, Private collection. The Athenaeum. 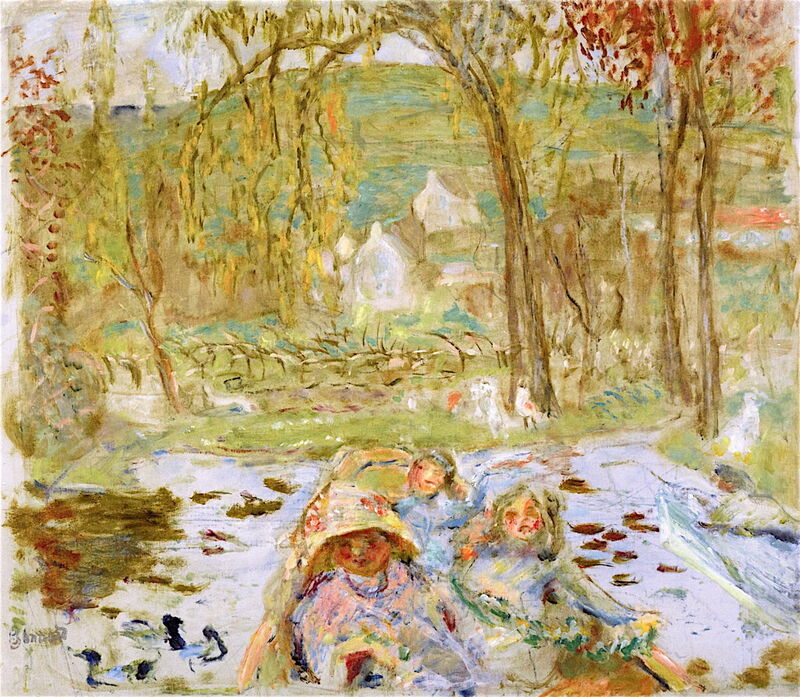 In 1907, Bonnard painted a pair of panels under the overall title of In the Country. Each shows two figures from an idyllic family: Father and Daughter, with a large white dog in the foreground, and Mother and Child, with a smaller black dog which resembles Marthe’s dog Black. These show the continuing influence of Japonisme. Pierre Bonnard (1867-1947), The Milliner (1907), oil on cardboard, 68.5 x 59 cm, Statens Museum for Kunst, Copenhagen, Denmark. The Athenaeum. The Milliner, painted in 1907, features Anita Champagne’s distinctive chignon. The hat which she has brought is laid carefully on a chair beside her. Early in 1908, Bonnard and Marthe were to visit North Africa. Posted in General, Life, Painting and tagged Bonnard, cityscape, japonisme, landscape, Monet, Nabis, painting, Roussel, Vuillard. Bookmark the permalink.